"Truman Address to 35th Division Reunion Memorial Servcie"
The second full year of peace after WWII, 1947 is notable for the events that occurred which would not really make news until much later. Part of this was because of the need for secrecy in relation to national security. Secrecy is the business of the Central Intelligence Agency, which was created in 1947. 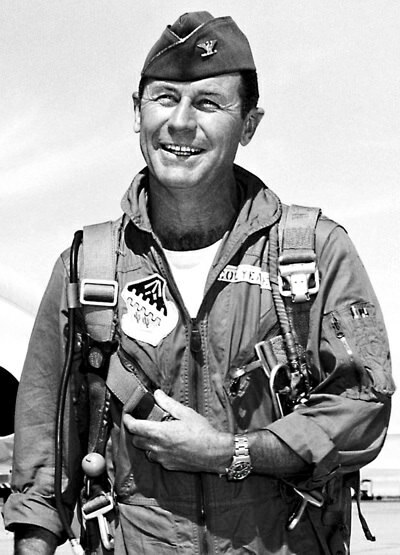 The year also saw Chuck Yeager fly faster than the speed of sound, and although Yeager was awarded the MacKay and Collier Trophies, his contribution to aviation would not be generally recognized until Tom Wolfe's The Right Stuff was published in 1979. 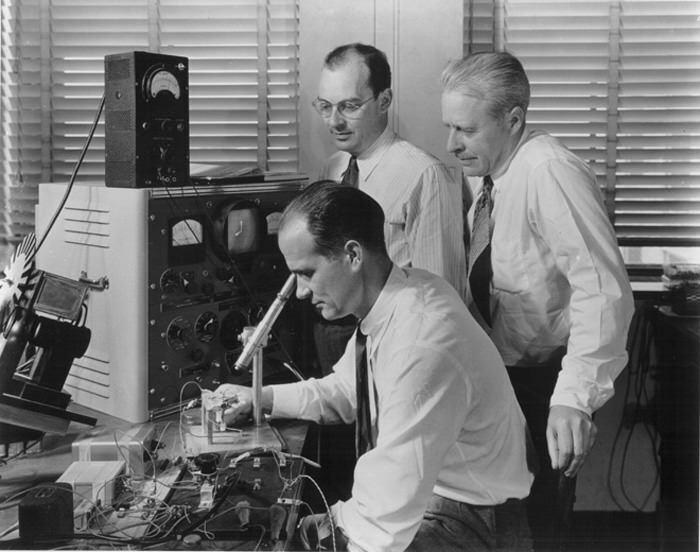 Scientists at Bell Laboratories developed the transistor, which would not only revolutionize radios and televisions, it would spawn the microchip and computer industries. The War was still fresh in people's minds in 1947. Just a week before Valentine's Day, Canada would close the last of the War Bride Reception Centers. During the War, 43,500 women (accompanied by 21,000 children) from Great Britain would marry Canadian servicemen and immigrate to North America. On Feb 9, Cesar Saerchinger discusses the formation of the UN Security Council and the council's duties in the new Atomic world. In March, Saerchinger would discuss the Conference of Foreign Ministers in Moscow, which would take a back seat to the tensions over the Greek Civil War. The situation in Greece would lead to the announcement of the Truman Doctrine, which stated the position of the United States that it would support governments whose countries were in danger of falling to the Communists. This is generally considered the opening of the Cold War. In April, Princess Elizabeth spoke to the world over the BBC on the occasion of her 21st birthday, and in July the Royal Family will announce her betrothal to Lieutenant Philip Mountbatten. The couple will marry at Westminster Abbey in November. On April 27 came the announcement that Babe Ruth would assume the title of Director of Baseball for the American Legion. Ruth had been largely inactive in baseball since his playing days came to an end in 1935. More stricken by cancer, Ruth would take this last chance to continue serving the game and the young men who meant so much to him. On May 3, Jet Pilot wins the Kentucky Derby by a head at 6 to 1. One of the earliest Cold War campaigns was the broadcasts of The Voice of America, which were countered by English language news broadcasts from Radio Moscow. On June 5, in a speech at Harvard University, Secretary of State George Marshall announced a plan for the economic recovery of War torn Europe. On July 8, the Army Air force announced the recovery of a "flying disk" which crash landed near Roswell, New Mexico. The incident made minor headlines at the time, mostly because of flying saucer sitings earlier in the summer in Washington State. 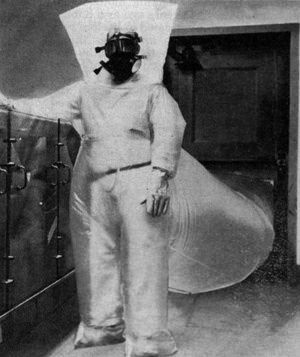 However, the incident was largely forgotten until the Seventies when the Roswell Incident became the basis of several popular conspiracy theories. The next week Warriors for Peace profiles Task Force Furnace, a US Army command near Yuma, Arizona, which is tasked with developing and testing gear to allow our boys to fight efficiently in desert conditions. On July 11, the SS Exodus sails from Marseille, carrying 4,515 Jewish emigrants to illegally enter Palestine. A week later, the ship was intercepted by the Royal Navy 20 miles off Haifa. 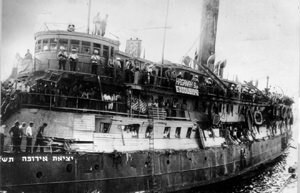 Although the ship failed to deliver its passengers to the Holy Land, the incident focused the world's attention on the struggle for a Jewish Homeland in Palestine. On July 31, reports of Jewish terrorists killing British soldiers in Palestine are broadcast on the ABC News. 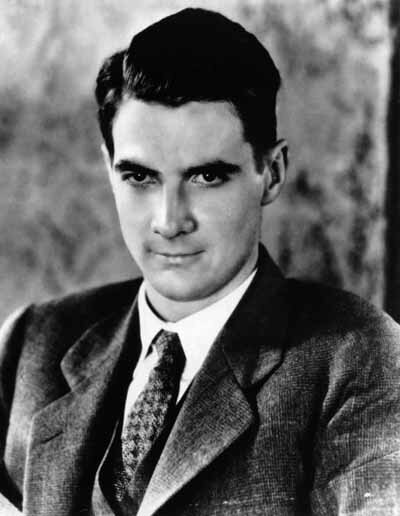 Howard Hughes and Liberty Ship builder Henry Kaiser were looked at by the Senate War Investigating Committee for misuse of government funds while building the HK-1 Hercules, the Spruce Goose. The hearings are the subject of an ABC Special report on August 5. 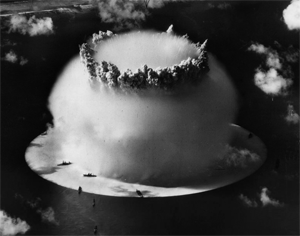 Of course, the huge aircraft was not completed in time to use in the War, but frustrated by the hearings, Hughes managed to get the monster into the air on November 2. During the first two weeks of September, Walter Winchell reports that the Russians are not faring well at the United Nations in Lake Success, NY. He also warns of Communist infiltration of American labor organizations. Hollywood Fights Back showcases Hollywood stars who are set to fight for their First Amendment Rights in response to the House Un American Activities Committee. Various news programs report rioting in France during November and December, instigated by the French Communist Party. Demonstrations in the Holy Land are also reported after the UN votes to partition Palestine into Jewish and Arab sectors. The AFRS Christmas Special this year skips the usual Hollywood Variety format and presents a drama of soldiers on barracks duty in occupied Germany, far from home. Be the first to comment on "News Recordings 1947"